New Chinese large military transport aircraft Yun-20 could enter in service for 2018. The Chinese-made first jumbo airfreighter is set for take-off into official service, its chief designer said weeks after its successful maiden test flight. When fitted with Chinese-designed and manufactured engines, the Yun-20, or Transport-20, will have a greater take-off weight, longer fuselage and carry more cargo, said Tang Changhong, who has led the design team of the jumbo aircraft since 2007. 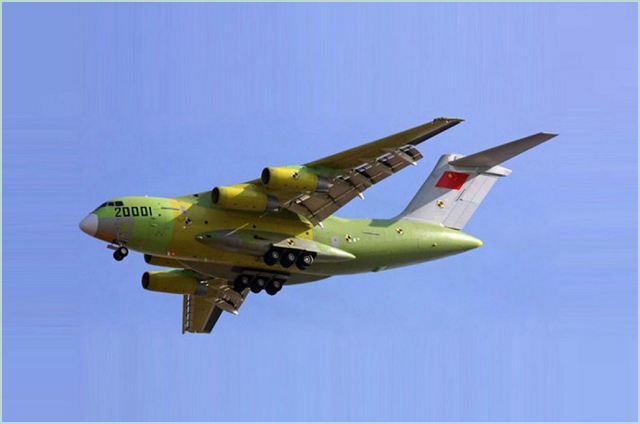 Chinese-made Yun-20 large military transport aircraft during flight test in January 2013. It will be in service probably within five years, depending on tests, Tang told China Daily. The 15-meter-high aircraft underwent a successful test flight on Jan 26. The Ministry of Defense confirmed shortly after the successful test flight that the Yun-20, mainly developed by the Xi'an Aircraft Industry (Group) Co Ltd, has a load-carrying capacity of 66 metric tons. It is 47 meters long, has a wingspan of 45 meters and a maximum take-off weight of 200 tons, Xinhua News Agency reported on March 3. "We are still conducting test flights. They are going well, but more tests have to be carried out before it is put into use," Tang said. Tang made the remarks on the sidelines of the annual session of the National Committee of the Chinese People's Political Consultative Conference, the country's top political advisory body. The meeting concluded last Tuesday. Even when it is in service, designers will be carrying out upgrades to improve its performance, he said. Tang revealed that domestically designed and manufactured engines will be tested during test flights and once they have passed various tests they will power the jumbo airfreighter. The Chinese engines perform better in terms of fuel efficiency and thrust-weight ratio, he said. Tang also said that, as is international practice, an aircraft could use several types of engines. China's largest transporter had been the Yun-8, which has a maximum take-off weight of 61 tons. The Yun-8 debuted in 1975. The Yun-20 can operate in adverse weather and a range of topographical conditions, Tang said. "It can serve peace-keeping missions and bring in large quantities of aid for humanitarian missions." Tang, a graduate of the Beijing University of Aeronautics and Astronautics, works at the No 1 Aircraft Design Institute under the Aviation Industry Corp of China. In addition to the institute, at least 1,000 companies or research institutes have been involved in design and production of the jumbo, according to Tang. The transport plane puts China in an exclusive club of countries and signals an ability to produce homegrown technology to boost its defense capacity, Xinhua reported in January. "The successful test flight of the Yun-20 marks a milestone in China's aviation industry and we're moving a step closer toward building a strategic air power for the country," the news agency quoted Tang as saying earlier this month.